Dan Leon, a writer and editor who lives in Jerusalem, is a former senior editor of the New Outlook and co-managing editor of the Palestine-Israel Journal. 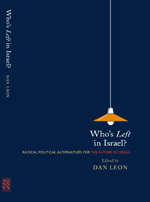 Contributing authors: Shulamit Aloni, civil rights activist and founder of Ratz and Meretz; Uri Avnery, journalist and head of the Peace Bloc; Hillel Schenker, co-managing editor of the Palestine-Israel Journal; Tamar Gozansky, former MK (Hadash) and champion of social equality; Amira Hass, author and journalist; Dr. Ilan Pappe, historian; Prof. Menahem Klein of Bar-Ilan University, an international expert on Jerusalem; Dr. As’ad Ghanem, co-director of Sikkuy, an association promoting equality for Arab citizens; Dr Lev Grinberg, political sociologist, Ben-Gurion University; Victor Cygielman, co-founder of the Palestine-Israel Journal; Prof. David Newman teaches political geography at Ben-Gurion University; MK Avraham Burg, former Speaker of the Knesset; Dr. Alon Tal is head of research at the Arava Institute for environmental studies; Dr. Erella Shadmi teaches and writes on feminism, identity, lesbianism and policing; Dr. Henrietta Kalev-Dahan heads the gender study program at Ben-Gurion University. 2 A Land Without a People . . .
5 The End of Zionism? 16 Jerusalem: Constructive Division or Spartaheid?